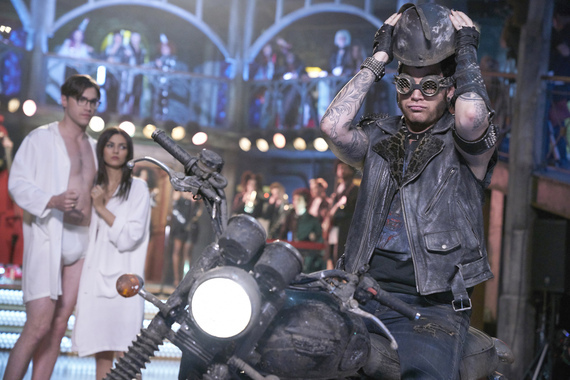 One-shot musicals have had a modest renaissance on TV lately, but the real bet for Fox with its new version of The Rocky Horror Picture Show is that a campy cult movie can win over a third generation. With a distinctly contemporary cast that includes Laverne Cox, Ryan McCartan, Adam Lambert and Victoria Justice, this new Rocky Horror - a two-hour movie that airs at 8 p.m. ET Thursday - features a lot of catchy, flashy and high-energy music. What it's still mostly selling, though, is off-center characters prancing and dancing through a goofy horror movie sendup involving weird romance, elusive aliens and, well, the truth is that there's very little point in trying to tidily synopsize the plot of The Rocky Horror Picture Show, because if you could, it would deflate the whole thing. The plot, such as it is, starts with newly engaged Brad Majors (McCartan) and Janet Weiss (Justice) (above) getting stranded when their car breaks down in the rain. Trying to find a telephone - this Rocky Horror isn't so contemporary that anyone has a cell phone - they walk back to a creepy castle whose primary host turns out to be Dr. Frank-N-Furter, played hugely and delightfully by Cox (above). 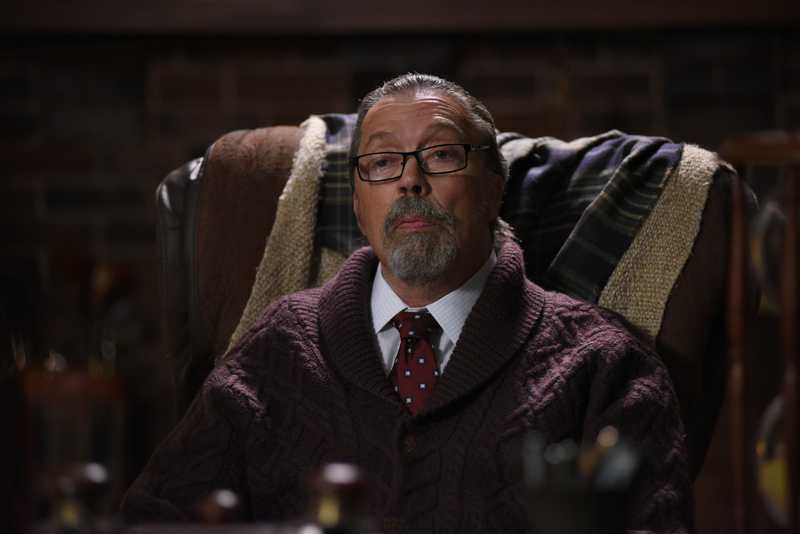 Tim Curry, who played Frank-N-Further in the 1975 movie, becomes a sort of generational bridge here by playing the criminologist narrator (above). In any case, Brad and Janet get yanked right into the bizarre world of the castle. Eventually they are both seduced by Frank-N-Furter, during the interludes among the half-dozen musical numbers imaginatively staged by veteran Kenny Ortega. Janet also falls for the studly Rocky (Staz Nair), who was created by Frank-N-Furter and rises out of an ice bath. That doesn't particularly please Brad, but then, Brad himself is as short on morality as he is on brains. It's all part of the show's omnipresent running gag, of course. Rocky Horror didn't enter American culture, first as a stage show and then as a movie, because it has profound Shakespearian elegance. Its sheer anarchy, combined with the fact it never takes anything except the music seriously, teed it up to become a cult fave and it did. For many years, Rocky Horror was a weekend midnight staple at theaters around the country. Patrons would dress up as characters and recite specific phrases back to the screen at certain precise moments. It became a communal event for a generation of cult movie fans, and that endurance gave it the impetus for further events like the 2000 Broadway revival that brought in a second generation. For today's younger movie fans, though, meaning early 20s and younger, Rocky Horror is just as likely to be something their parents or even grandparents talked about. It's another generation's fad, like Pac-Man. But the producers are convinced that the music is strong enough, and the concept of a horror movie sendup is engaging enough, that a new generation could adopt it as their own. At the same time, this new version wants to keep the older fans as well. It's largely faithful to the original script, and it inserts a half-dozen "callback" scenes, in which we see an audience in a movie theater perform some of the old rituals and recite some of the old lines. When Janet and Brad leave the car in the rain, for instance, and Janet holds a newspaper over her head, everyone in the audience does the same. These audience-reaction scenes may be valuable some day to cultural historians. They don't add much to the movie on television now. Nor is television an ideal medium for Rocky Horror . It eliminates communal audience reaction, of course, and it also reminds us that this is a picture, a la Gone With the Wind, where size matters. Like Cox's Frank-N-Furter, the whole show gets better as it gets bigger. It's loud and splashy and in a theater, it could envelop you. Even on a large TV screen, there's a degree of removal. On the hopeful side for the producers, that elusive younger generation has grown up watching shows like High School Musical, so screen size may not matter so much to them. However you slice it, it looks like meatloaf again.